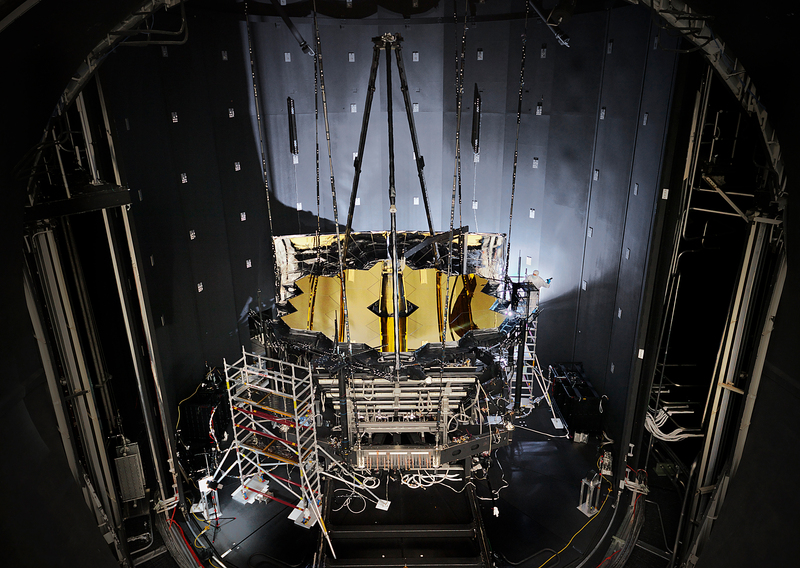 November 20, 2017 – Harris Corporation has partnered with NASA’s Johnson Space Center to successfully complete thermal vacuum testing for the James Webb Space Telescope – validating its ability to operate in the frigid space environment. The Webb telescope will be the premier space observatory of the next decade, and will study galaxy, star and planet formation in the universe. Harris’ team helped safeguard the telescope in Houston during Hurricane Harvey and ensured uninterrupted testing – including monitoring more than 1,000 sensors on the telescope around the clock. In addition, Harris designed a multi-wavelength interferometer system that aligned 18 mirror segments into one 6.5-meter phased primary mirror to verify optical quality and placement. Harris engineers integrated all 18 mirror segments, built by Ball Aerospace, on the Webb telescope. Harris was also responsible for the design and installation of the cryogenic test equipment, including a simulator to mimic the temperature of the Sun. Additionally, Harris built the structure that held and isolated the telescope during vibration and acoustic testing. With environmental, thermal and optical tests complete, the Webb telescope will be shipped to California, where it will be integrated with the spacecraft, forming the complete observatory. The Webb telescope is designed to unravel some of the greatest mysteries of the universe, from discovering the first stars and galaxies that formed after the big bang to studying the atmospheres of planets around other stars. It is a joint project of NASA, ESA (the European Space Agency) and the Canadian Space Agency.